Yes, Big Hungry Shelby is a blog about upstate New York restaurants and food happenings. But it’s true that, on occasion, I have cause to venture farther afield. Last week was one such occasion, as my parents and I, plus Miss TI board members Deltra and Stan, trekked down to Staten Island to support Morgan Bocciolatt, Miss TI 2011, in her bid for Miss New York. Morgan did the Thousand Islands proud, finishing in the Top 11 of the pageant and bringing home the Miss America scholarship for Outstanding Community Service. While on the island called Staten, we happened across a great restaurant that seemed the antithesis of what you think when you think outer boroughs: South Fin Grill. Overlooking the Verrazano Bridge and Brooklyn, the waterfront deck is a transformative space – you feel like you’re on vacation in a gorgeous port city (ok, I guess you are…this is still NYC). The seafood-centric menu is modern, forward-thinking and progressive, but sporting enough summer classics to appeal to our varied group of diners. As I mentioned last week, I’m on a bit of a limited diet just now, due to some medication I’m taking for some hearing problems. The South Fin menu constituted the perfect refuge for me: lots of fresh, low sodium options full of flavor with ingredients like balsamic, citrus and fruit. I had the “Tropical” salad off the raw bar menu as well as the tomato mozzarella tart. Rather than feeling deprived by these light choices, the bold flavors, artful presentation and quality ingredients provided loads of satisfaction. The Tropical was comprised of cooked lump crabmeat topped with a mango and avocado salad and some light microgreens. 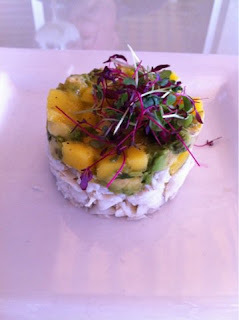 It was unctuous, decadent, popping with citrusy mango lusciousness and that silky luxuriance of avocado. This was simply a gorgeous dish, and one I may rip off for light dinners at home all summer. My tomato and mozzarella tart was decidedly more earthy, but still light. It was slightly warm, just a little gooey, kissed with a well-reduced balsamic drizzle and a mass of peppery, clean arugula leaves. The tart shell was super crispy, and a fantastic textural foil to the ripe grape tomatoes and fresh bocconcini mozzarella balls. Mom and Stan both ordered a cool idea from the appetizer menu: the lobster tasting. This combo of lobster corn chowder and a petite lobster roll echoes New England summertime at its best. The soup was simply outstanding: a rich, deep lobster broth kept light by the absence of cream, tons of freshly-picked corn flavor and chunks of tender lobster. The roll, while small, was dynamic. It is the absolute essence of summer: richness owing solely to lobster with little interference from mayonnaise. Simple and delicious. Dad ordered a forbidden fruit for me: the wedge salad. Holy cats, this looked divine! A towering, crisp wedge of old school iceberg lettuce was crowned with tomatoes, gorgeous bacon, chunky blue cheese dressing and wickedly tempting crispy onion straws. He was happy; I was jealous. The shrimp cocktail he had alongside it was generous and fresh. Thumbs up. Deltra is a perpetual dieter, so her special order non-panini would be a little odd to recap here, but I can tell you that the sweet potato fries she had on the side were everything you want in such an item. They were crunchy, sweet, salty and tender. Perfection. Now that Miss New York is making its home in Staten Island, my family and I will be returning to the South Fin Grill, and I can tell you what I have in my sights for next time: The Mansion, a raw bar behemoth of steamed lobster, ceviche, oysters, clams, crab claws and shrimp. Alternatively, the pictures I have seen of South Fin’s sushi looks tempting, and the scallop entrée is calling my name. I also would like to go at night, to experience that gorgeous deck with the bridge lit up in the background. I can’t imagine Staten Island has a nicer spot to enjoy a good meal, especially after having experienced some of its more inland areas. We graded South Fin grill a nine on the BHS scale. Seriously, I had a major buzz on after lunch here, and I’m not even drinking alcohol right now! If you’re even in SI for business or pleasure, consider this gem on your must list. I’m almost done with this medication and its associated restrictions, Big Hungries. Thank God! I’m a little afraid I’m going to go insane with the salt as soon as I can. I’ve been eating lots of salad, fish, herbs and fruit for the past two weeks, and I’m ready to let bacon, mortadella, French fries and parmesan rule my world. I had a scant tablespoon of blue cheese on my lunch salad yesterday, and it was like Heaven. So, I can’t promise how unhealthy next week’s post will be, but you might want to check it out. My personality is big, my hunger is bigger!